Legacy Foundation has over 15 years experience with development and application of a variety of technologies including: solar heating systems, rural and village water supply, wind energy, rural transportation, and low cost housing. Through this, we have designed and developed of a wide range of sustainable technologies in renewable energy, water supply, sanitation and rural transport. Some of these have included ground breaking designs in windmills, Water pump, biogas generators, passive solar heaters and bicycle trailers for rural medical transport. Our current and main focus is on the development of micro-enterprise-based briquetting technologies. Biomass briquettes convert non-productive agricultural residues, yard wastes and junk mail into economic and environmentally sound heating and cooking fuel. Biomass briquettes are currently being used by families and communities in over 40 nations, world-wide. In developing countries, the briquettes are sold in the open market as a less expensive alternative to fuelwood. Briquette projects provide employment , especially to women, while saving the environment. In the USA, the emphasis is on research and development of a mechanized yet compact “one step” briquette maker for families and communities, to turn their junk mail and yard wastes directly into a useable fuel. Research proceeds as funds become available. Legacy Foundation, in cooperation with Rok Stoves, has recently developed a ground-breaking, hand-operated ratchet type briquette press which is extremely compact, yet produces briquettes quickly and efficiently. It has direct application to emergency relief operations, where food supply and basic sanitation is threatened due to lack of basic cooking, space heating and wash up water. This machine will soon be available for sale (Fall 2010). “How to make and operate” manuals for the Rachet press will also be available, in the same format as the other manuals on our site. Contact us for further information. 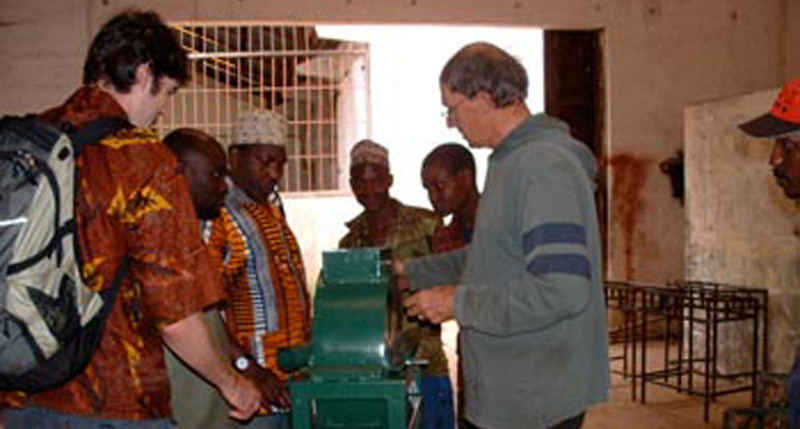 The Legacy Foundation has also tested emissions from the briquettes to ensure environmental compliance in cooperation with Southern Oregon University, Ashland Oregon, and the Northwest Forensics Laboratories of the Department of the Interior, and in collaboration with stove developers (Rok Stoves and Nottingham University, UK).